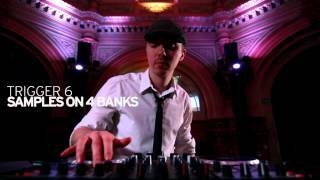 By introducing the Terminal Mix 4, Reloop has broken new ground once again with this fully integrated 4-channel mixer* offering a wealth of features, including 3-fold EQ with intelligent kill technique* and filter modulation capabilities per channel. 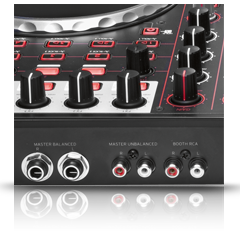 Any of the 4 channels can be easily assigned to the crossfader via the controls on the front panel, where you will also be able to adjust the crossfader curve. 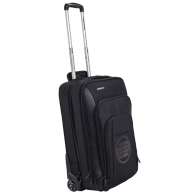 The entire transport section is fully equipped with rubberised buttons which offer a comfortable pressure point whilst also being extremely durable. The performance section* features an extensive 8-button layout which can be utilised over 2 separate layers for true versatility. 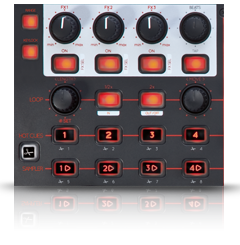 On the first layer 4 hot cues can be fired off and 4 sample decks can be triggered simultaneously. 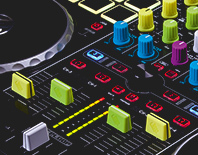 Depending on the software used, other creative possibilities are available, for example the option of accessing hot cues/samples 5-8 on the second layer - or with future software updates this section can be enhanced even further with brand new performance modes (Cut'n'Slice) for live remixing. 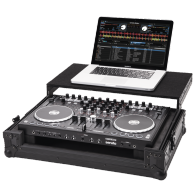 The audio section offers a vast array of connecting possibilities for your master PA (including balanced output jacks), a zone function and a DJ booth system. Also very practical are the 2 headphones connections (6.3 mm & 3.5 mm) which can be adjusted with a 1-band equalizer. A microphone connection with a 1-fold EQ for MCs, hosts or singers has also been integrated and can be adjusted via a flexible routing switching system. 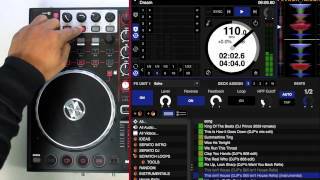 Furthermore, it's possible to connect a turntable, CD/MP3 player, or iPhone/iPod to the Aux input which can be routed to the master or even software! 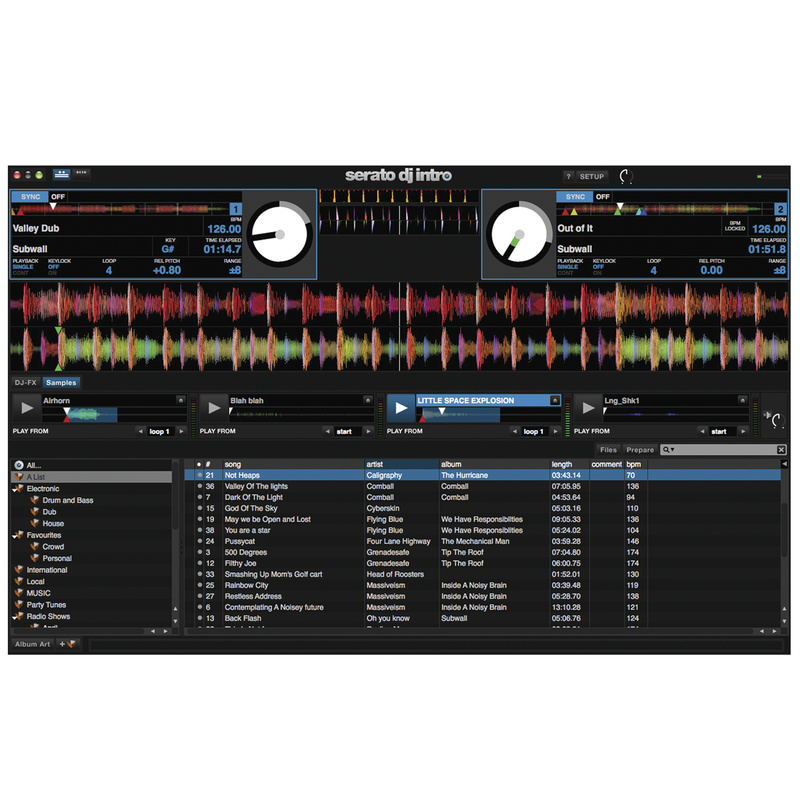 Terminal Mix comes Plug'n'Play ready with Serato DJ Intro and a Virtual DJ 4-Deck LE (Reloop Edition). 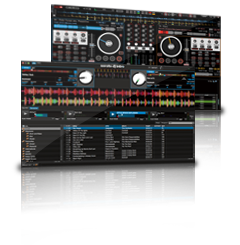 Traktor Pro 2 mappings are also available. Check in at Terminal Mix 4. 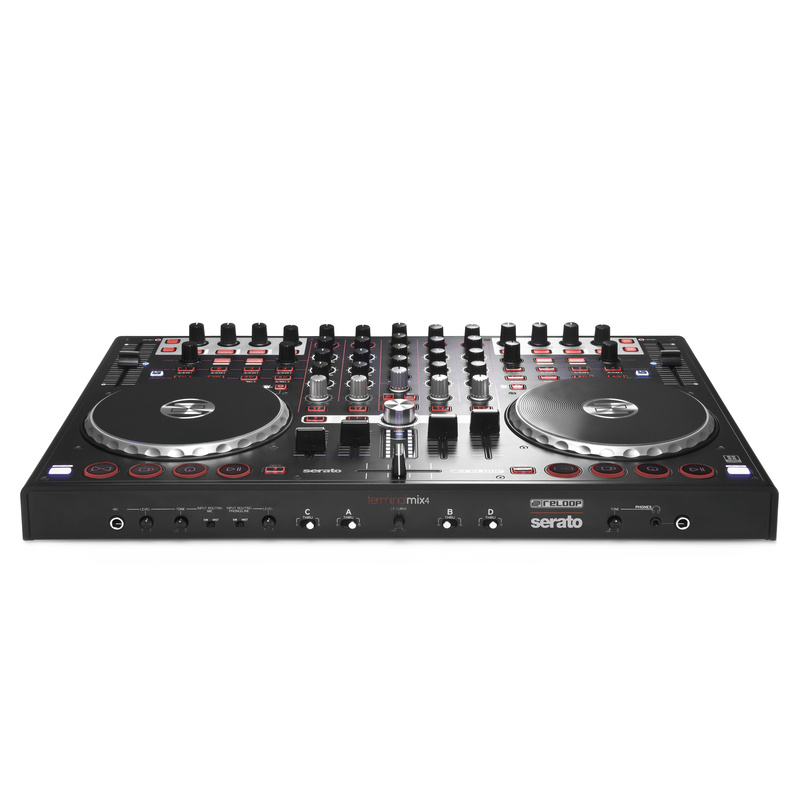 Full-sized four channel controller for Serato with high quality components and lovely jog wheels that just beg to be scratche. [...] Welche Musikrichtung man auch immer verbunden ist, mit dem Terminal Mix 4 kann man in jedem Fall eine Top Performance hinlegen und mit dem Gesamtpaket bekommt man eine sehr gute Komplettlösung angeboten. Der Terminal Mix 4 ist ein vollwertiger Vierkanal-Controller, der sich trotz relativ geringer Anschaffungskosten nicht vor edlen Boliden verstecken muss. 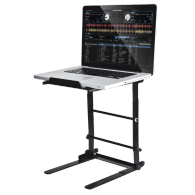 [...] Obwohl das Gerät auf Serato fokussiert ist, macht es auch mit jedem anderen DJ-Programm eine gute Figur. Ohne Zweifel ein neues Controller-Schwergewicht, das Einsteiger wie auch Profis glücklich machen dürfte. 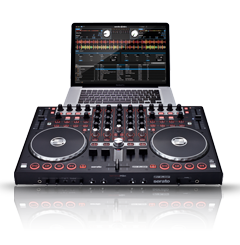 Because it’s a high-quality unit with a solid build, excellent sound, and a ton of great features, at $600, you could make the argument that paying a little more for the high-end software is reasonable. 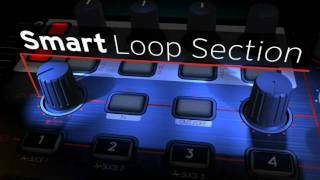 The Reloop Terminal Mix 4 is one of the best controllers outthere. 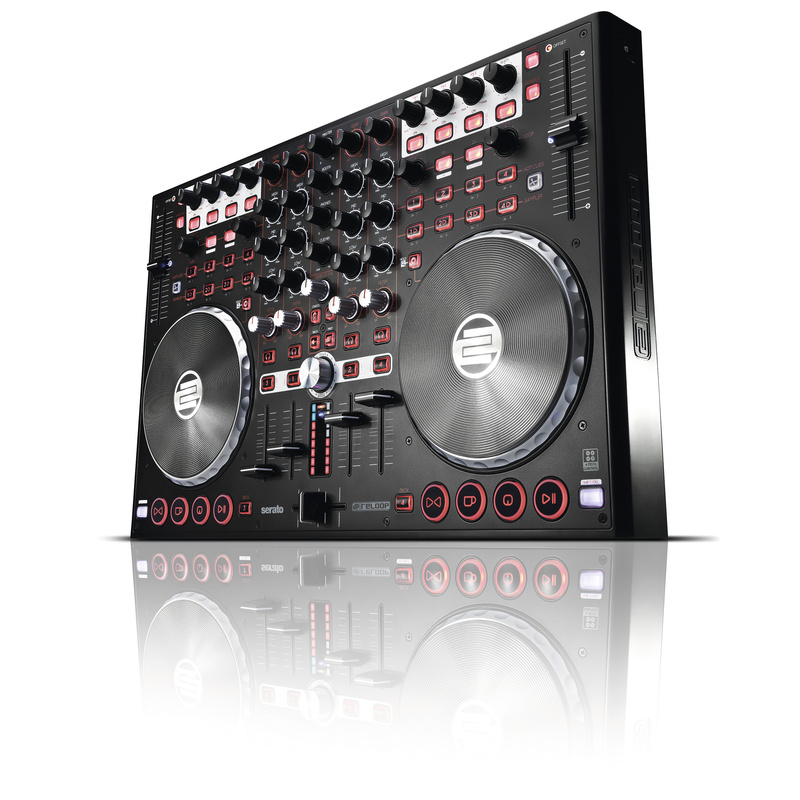 It's very solid, all the features are there and it has a great layout, the rubber knobs and jogwheel coating are nice, which makes it perfect for controllerists and scratch DJs. 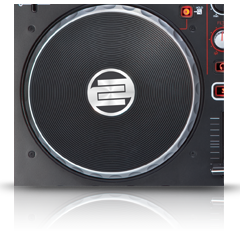 [...] it has singulary the best jogwheels on any DJ controller. [...] They're big but low profile, beautifully engineered in aluminium, and have a nice textured top surface that just feels right. Everything else feels expensive, too, from the long-throw, hi-res pitch controls to the extremely loose crossfader, to the damped, weighted libary knob dead centre of the unit, to the rubberised transport controls at the front. 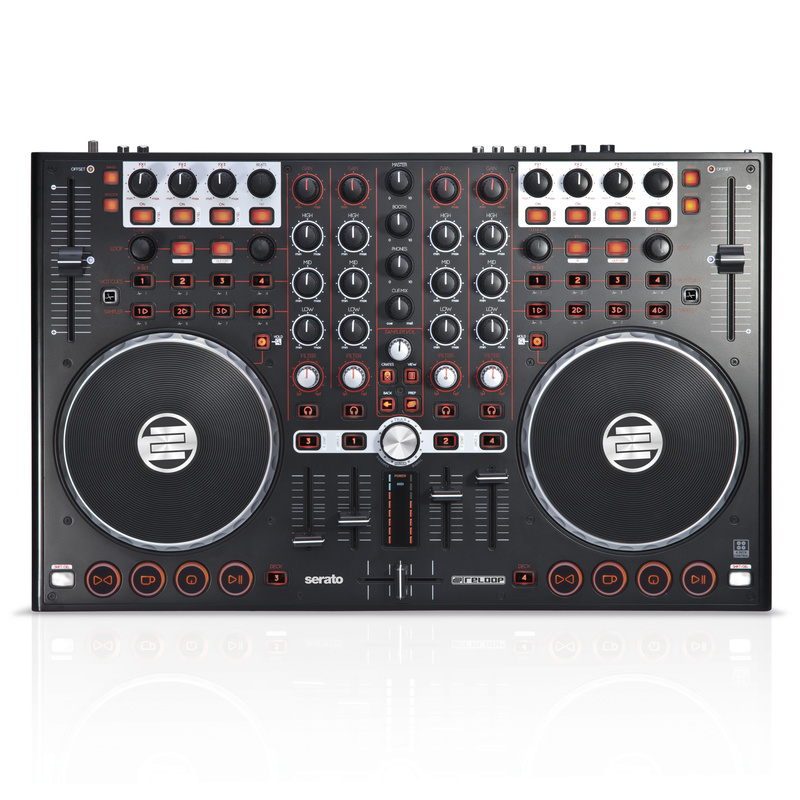 It's a pro-feeling DJ controller, without a doubt. I was impressed with the sound quality from the unit. [...] sounded warm and summery, just as it should, with good bass, twinkling highs and convincing filter effects from the built-in channel filters. The headphones volume was plenty loud enough and overall I had no complaints. 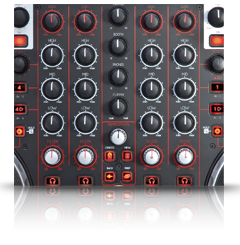 [...] In Conclusion, The Reloop Terminal Mix 4 is a high-quality and heavy-duty Digital DJ controller with some of the best jog wheels ever made and very nice fader feel to go with it. 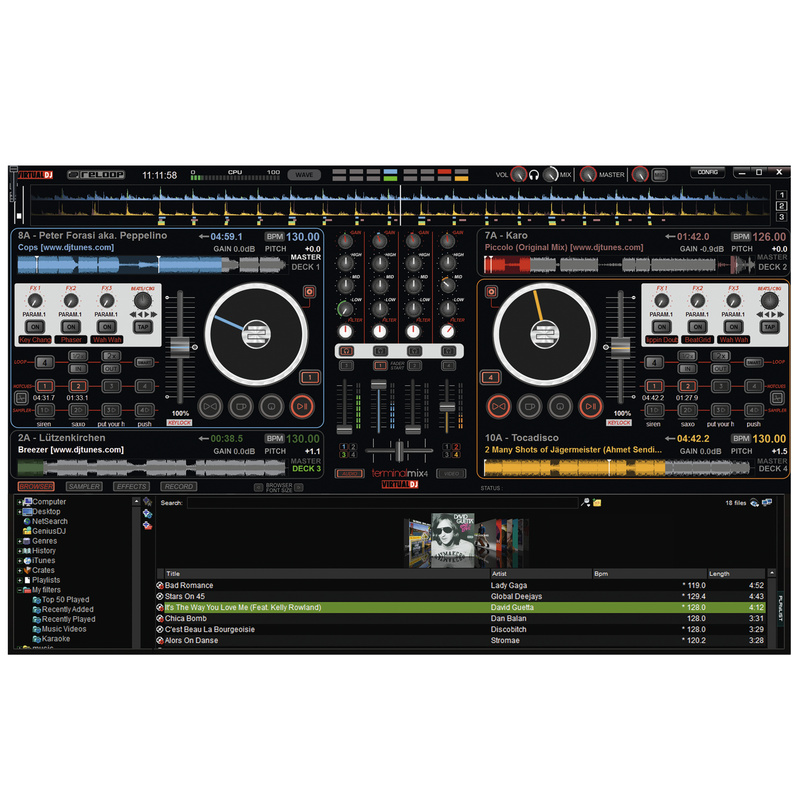 [...] We are going to recommend the Reloop Terminal Mix 4 to any DJ who wants a professional and versatile (can be MIDI programmed for almost anything) DJ controller with high quality control feel and a bunch of on-board features to please DJ's everywhere. 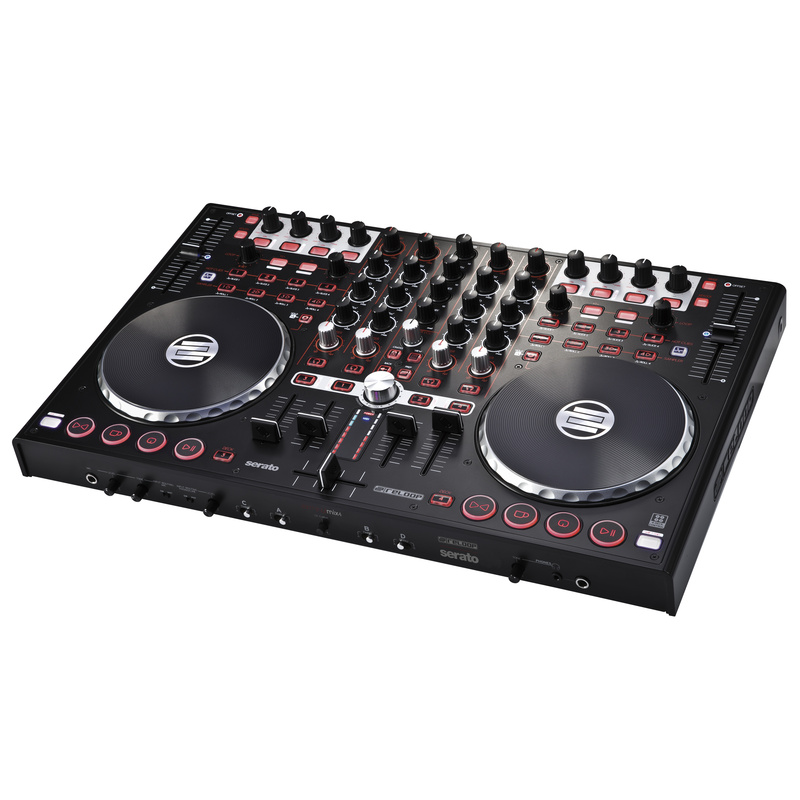 The Terminal Mix 4 is a high-quality, durable, well-designed controller with enough buttons and knobs to control all of the major aspects of today’s 4-deck digital DJ software. 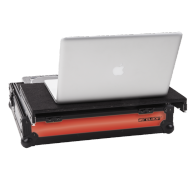 It is truly plug-and-play on your OS of choice (Linux too) and includes a choice of good quality software that will satisfy the needs of all but the most demanding users. 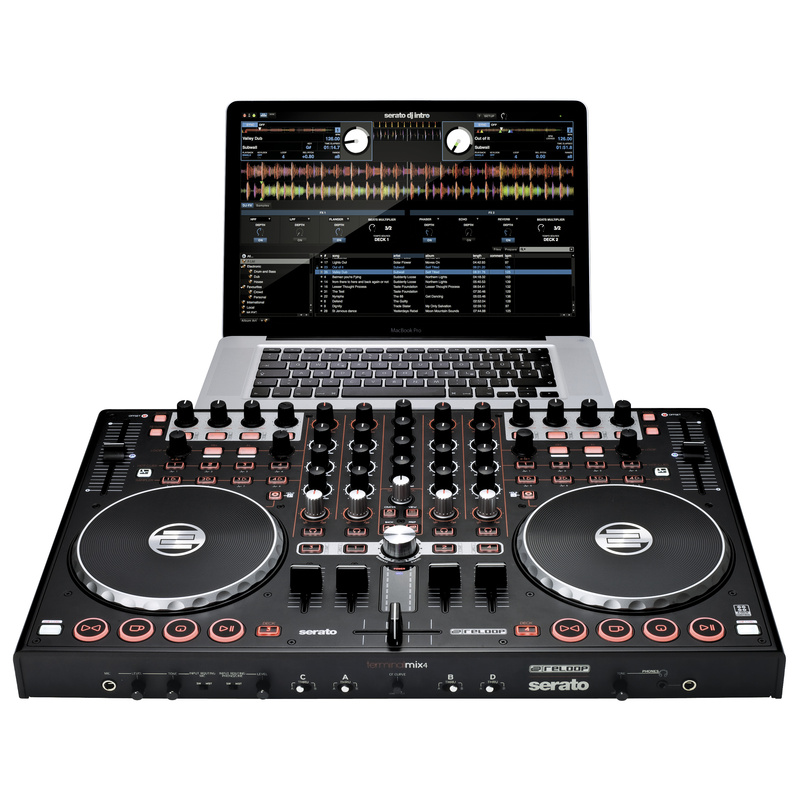 Scratch DJs will be happy with the size and performance of the wheels and cross-fader, and MIDI mapping tweakers will appreciate that almost every control has a shifted counterpart. 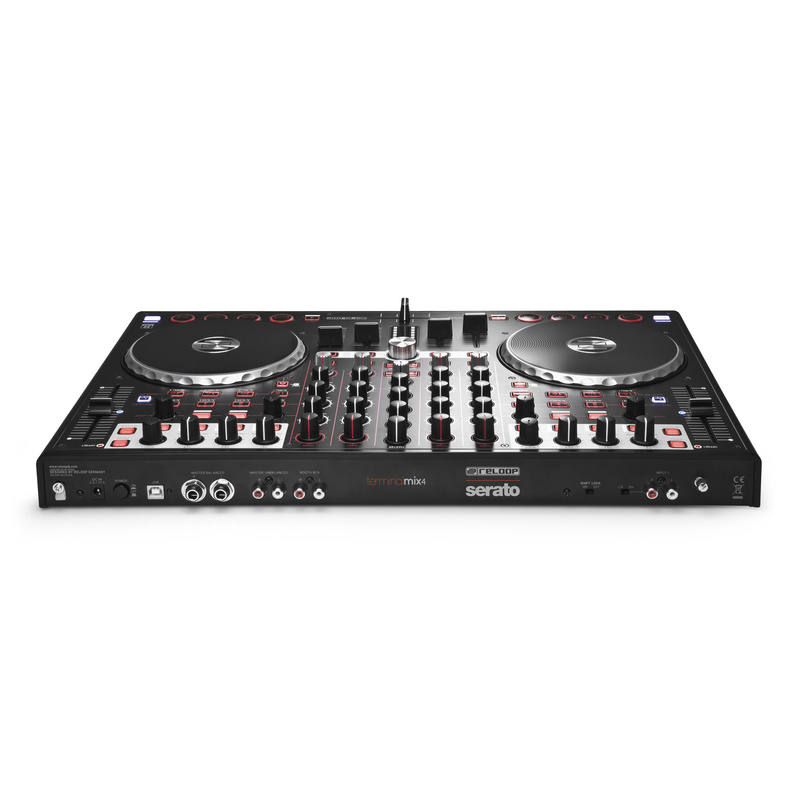 [...] Reloop have made a controller that sounds good and is laid out in an intuitive way – an essential ingredient in any DJ controller.